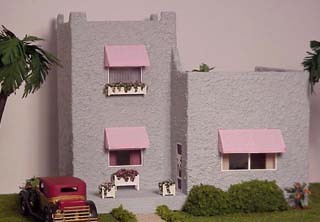 "The Palms" is a Mediterranean Revival style house designed by Pam Scott. I built it from her instructions and plans printed in LEN , volume 3, issue 4. Inspiration for the furniture comes from several different sources. 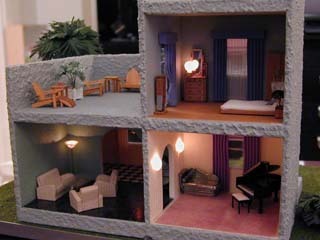 Most are based on 1:48 or 1:12 scale how-tos from magazines. My instructions for the music room sconces, and a non-working version of the Art Deco lamp in the living room, were printed in LEN volume 4, issue 5. I used tubing for the stem of my Art Deco lamp, and pulled ultra-fine wires through it. Unfortunately, it wasn't as easy as it may sound - but if you have the patience, electrifying your settings is definitely worth the effort. Note the very Art Deco cabinet, based on a pic I found on the web. The table base is a kneeling camel. It was originally a metal miniature of a standing camel, but with needle files and some patience I could bend the legs. Over the sofa is an oval mirror, hung from a chain. I framed it with narrow metal braid. The needlepointed rug is based on a mid-30's rug by a Swedish designer. 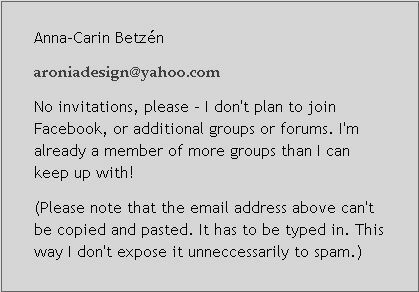 My chart for stitching it is available in the DIY projects section of this site. 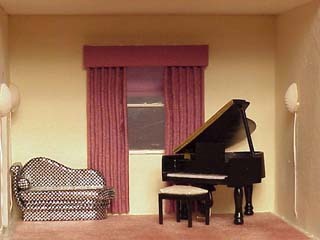 I built the piano and chaise longue from Madelyn Cook's instructions in Dollhouse Miniatures. Since taking the photo, I've added more Art Deco furniture to the room. 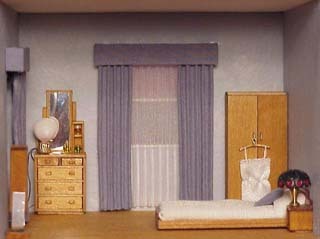 The Art Deco bedroom furniture is based on 1" scale designs in Dollhouse Miniatures (the dresser and bed plans were in the November and December issues in 1998). The non-working bedside lamp is made from a turned brass finding and a brass filigree. The curtains of this house were my first experiments using d. Anne Ruff 's Pretty Pleat Tiny. 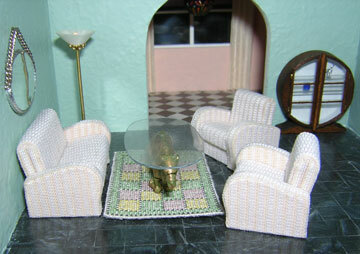 I based the adirondack chairs on a 1" design in Dollhouse Miniatures. 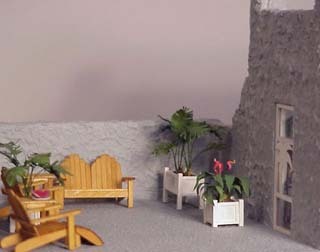 The planters on the terrace and by the front door are also based on 1" scale designs. 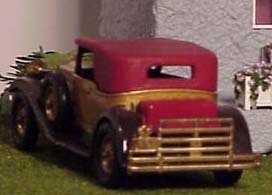 The car is from Matchbox's "Models Of Yesteryear" series - there are several different models in scales close to 1:48 scale.